Helen Spivey (at left), who celebrates her 90th birthday on May 10th, is the longtime Co-Chair of Save the Manatee Club’s Board of Directors. She shares the chairmanship with singer/songwriter Jimmy Buffett (at right), who is also the Club’s Co-Founder. 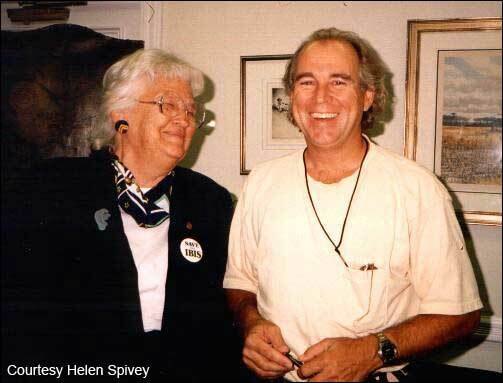 Lifetime environmental advocate, Helen Spivey, will celebrate her 90th birthday on May 10th. People have always referred to her as The Manatee Lady because of her decades of hard work for manatee protection – first as a concerned citizen, then as a member of the Crystal River, Florida, City Council, then as an elected member of the Florida House of Representatives, and also because she is the longtime Co-Chair of Save the Manatee Club’s Board of Directors. She shares the chairmanship with renowned singer/songwriter Jimmy Buffett, who is also the Club’s Co-Founder. “Helen is the classic example of a community-minded concerned citizen and believes that a life worth living is a life of service to help make the world a better place,” said Patrick Rose, who is the Executive Director of Save the Manatee Club. “She was one of the first manatee protection pioneers in Crystal River, which is one of the most important areas for manatees in the state of Florida,” he added. In the early days, Helen was not popular with those who opposed manatee protection measures. Now, however, she is beloved for her strong activism and widely revered for her decades of volunteer work that has made manatees much safer – notably for her successful work to publicly acquire the Three Sisters Springs parcel abutting two manatee refuges. She was an appointed member of the Florida Manatee Technical Advisory Council, the Manatee Forum, and numerous environmental committees. Her conservation work earned her awards from One Thousand Friends of Florida, The Sierra Club, Florida Consumer Action Network, The League of Conservation Voters, The Florida Audubon Society, The Nature Conservancy, and Save the Manatee Club. In 2010 Helen was honored with the Regional Director’s Conservation award from the U.S. Fish and Wildlife Service, which was announced on the floor of the House of Representatives. “Helen has made and is still making priceless contributions to the welfare of manatees and the natural environment. On the occasion of her 90th birthday, it’s a good day to loudly applaud her and thank her for her important work,” said Rose.